Some celebrations are held in February, others in the summer. One thing they all have in common: the chance to party like a local. Curacao prides itself on making sure everyone can enjoy the party. Considered one of the Caribbean's most gay-friendly destinations, it has hotels catering to gay tourists and an annual gay pride parade. "Our melting pot history has led to a progressive 'live and let live' philosophy that has long welcomed the LGBT community," says Andre Rojer of the Curacao Tourist Board. Where to stay: Sitting on a UNESCO World Heritage Site, Kura Hulanda Village (www.kurahulanda.com) features 18th- and 19th-century buildings restored to their original splendor. Cobblestone paths meander through lush gardens filled with art and inviting pools. An on-site museum details how Curacao was once the epicenter of the slave trade in the Caribbean. Rates start at $180 a night during Carnival. Insider tip: When it's time to eat, head to the food stalls of Plasa Bieu, also known as the Old Market. Sample the popular goat stew or traditional tutu, a dish of ground-up beans with sugar and other goodies. Trinidad is the mecca for Carnival in the Caribbean. The riotous, multicultural spectacle starts with the pre-dawn J'ouvert (daybreak in French Creole) on Carnival Monday, Feb. 27, when people throw paint on one another. It culminates with Parade of the Bands, where several thousand scantily clad costumed revelers dance to pulsating soca. Birthplace of the steel pan, Trinidad is an oil-rich country whose ports have long been flooded with empty oil drums. Resourceful locals turned them into instruments. Panorama, the world's largest steel pan competition, is held over several days in January and February leading up to Carnival, but the big final competition is Feb. 25 in Queen's Park Savannah in Port of Spain. Many of the preliminary competitions are held in Port of Spain's pan yards, where tourists are welcome to hear steel pan bands practice throughout the year. 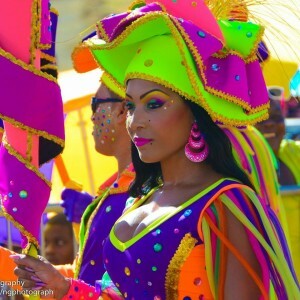 Tour companies like Banwari Experience (www.banwaricaribbean.com) will help you "play mas" with a Carnival band, which means you don a costume and march in the parade. They also can set you up to be part of fetes, Carnival-themed parties held all over the island that include your food and drink. Where to stay: Downtown Port of Spain's traffic is at its worst during Carnival, so consider the Hilton Trinidad (www.hiltoncaribbean.com/destinations/trinidad.html), within walking distance of Queen's Park Savannah, where many events are held. Carnival rates begin at $500 a night. Insider tip: If someone asks if you want a wine, they're not wondering if you'd like a chardonnay. They're asking if you want to wind … as in wind your hips or gyrate, presumably in tandem with the person asking. Known for its towering Piton mountains, breathtaking beaches and a world-class jazz festival, St. Lucia used to hold its Carnival before Lent. The country changed the festival date in 1999 to eliminate competition with Carnival titan Trinidad & Tobago and to attract more tourists to its lush playground in the summer. St. Lucian Carnival is a more intimate affair that remains on the smaller side, with roughly eight bands participating in the festivities. It culminates with the 3-mile-long Parade of the Bands through the capital city of Castries. Where to stay: Main events are on the north end of the island. The oceanfront St. James's Club Morgan Bay (www.morganbayresort.com) is a good choice in that area. Rates start at $291 a night for two people, including all food and drink. Insider tip: You'll hear the locals talk about "liming". Simply put, to lime is to party or to hang out. It refers to the art of doing nothing while sharing food, drink and laughter with friends. And no matter what season you visit, the fishing village of Gros Islet hosts a lively street party Friday nights, full of barbecue, drinks and dancing. Barbados could give Trinidad a run for the title of top party island — just don't call Barbados' event Carnival. It's Crop Over, and it's so important to this former British colony that it's a national holiday. As the name suggests, Crop Over celebrates the end of the harvest, on an island that was once among the world's largest sugar producers. Soca music competitions, the coronation of the Crop Over king and queen, parties, boat rides and parades — nearly two months of nonstop festivities lead up to the main event, Kadooment Day, the first Monday in August, when revelers parade through the streets in barely there bikinis loaded with sequins and feathered finery. You might even spot pop star Rihanna, who often returns to her native island for the festivities. Where to stay: Many events take place in the bustling capital, Bridgetown. To be in the heart of the party, try the beachfront Hilton Barbados. The concierge will assist with tickets to events and fetes. (www.hiltonbarbadosresort.com). Rates start at $199. Insider tip: Bring a bathing suit along on Kadooment Day. After parading and partying in the streets of Bridgetown, revelers head to the outskirts for a swim at Brandons Beach. Andrea is a freelance writer.